Maurer-Stutz Unmanned has been out and about doing some Water Tower Inspections in the Peoria Area! Have you had a need to inspect something that is difficult or relatively unsafe to reach? In the case of water towers that is usually the case. In the days of our aging infrastructure, some towers have become unsafe just to climb the ladder halfway up. The solution is to use drones! 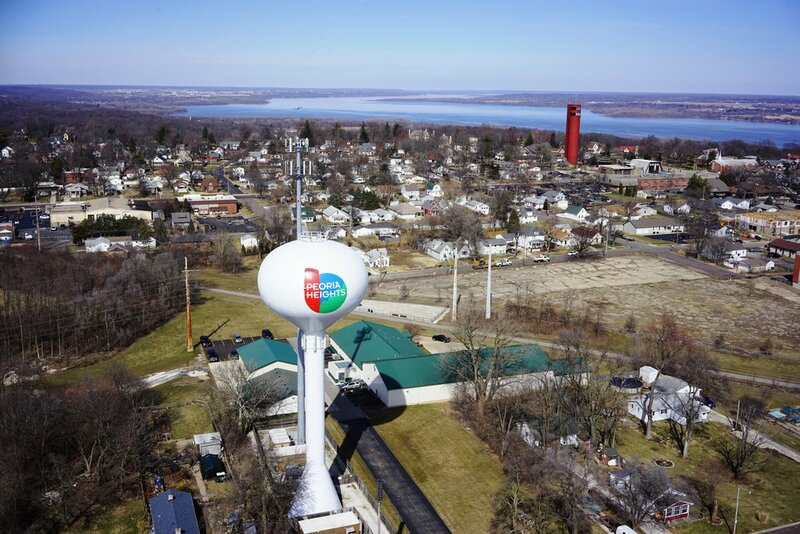 By flying an Unmanned Aerial Vehicle (UAV) that is equipped with a high resolution camera, Maurer-Stutz Unmanned is capable of gaining some of the most valuable data with respect to water towers in minutes! It can be as simple as checking to see if the lid is closed or assessing the extent of rust and corrosion of the tank. Other examples include checking work after a contractor completes maintenance, surveying the impacts of wildlife on equipment, and inspecting for structural fatigue or damage. Hazards like cellular antennas mounted on or near the tower pose serious health risks for inspectors when they are exposed to full strength signals in close proximity. These hazards require lengthy and cumbersome coordination with other organizations and agencies. That advance coordination typically ends up being the longest part of the entire inspection process. By using a drone, we are able to obtain the necessary data without putting someone in harms way or having to go through all of the advance coordination.